(Nanowerk News) The L-408 linear stage strikes a good balance of load capacity, precision, and low cost. It has applications in research and industry including optics, bio-tech, and assembly of miniature components and photonics instrumentation. 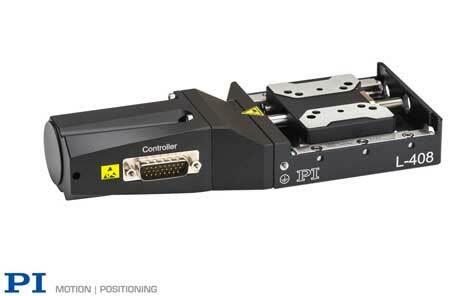 PI’s new compact X-axis linear stage provides precise motion and reliability with anti-creep crossed roller bearings. Driven by a high resolution leadscrew with 0.5mm pitch, minimum incremental motion of 0.1 microns (100nm) is achieved over a travel range of 1 inch (25mm). Despite its compact dimensions, the stage can handle payloads of 44lbs (200N) and provides a push/pull force of 11lbs (50N). Stepper and servo motors are offered with direct-drive and gearbox options. The maximum velocity of the direct-drive stages is 10mm/sec. The unidirectional repeatability of all versions is 0.5 microns. High resolution, motor-mounted optical encoders provide position feedback to the motion controller for closed-loop operation. PI is a leading manufacturer of air bearing stages, piezoelectric solutions, precision motion control equipment, and hexapod parallel-kinematics for semiconductor applications, photonics, bio-nano-technology and medical engineering. PI has been developing and manufacturing standard & custom precision products with piezoceramic and electromagnetic drives for 4 decades. The company has been ISO 9001 certified since 1994 and provides innovative, high-quality solutions for OEM and research. The PI group employs more than 1,000 people worldwide in 15 subsidiaries and R&D / engineering centers on 3 continents.